No one listens to Archie when he says he is a bear so he leaves home and goes into the woods where he makes friends with a bear. A very small boy in a bear suit and a very large bear share the fun of pretending, adventuring in the woods, and a honey sandwich next to a warm fire on a cold day. Which is really the boy, and which is the bear? It doesn’t matter—you are who you say you are. I am discovering that books where big things are friends with small things are my jam and I love that so many picture books incorporate this. 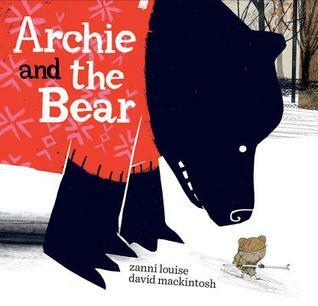 Louise tells the story of Archie, the bear who people keep mistaking for a boy. When Archie is sick of people calling him a boy, he goes into the woods and finds a real bear, a bear who thinks he’s a boy. This is a wholesome story that is told beautifully. There is heart and friendship and Mackintosh’s illustrations add gravity and a touch of magic. I felt the story slow down as I looked at these beautiful illustrations and though nothing is said of time or place, it felt like it was in an older time, somewhere in some small eastern European village and while that sounds obscure, it’s where my mind went and I loved it. Mackintosh’s illustrations offer fantastic scale in regards to Archie’s size in relation to the world and to the bear. He uses a mixture of watercolour and rough pencils and masters capturing scale and magnitude about the expansiveness of a forest as well as the confines of it. I couldn’t help but admire the skill he had in perfectly executing so many different styles and techniques and marrying them to Louise’s words. The story explores the two new friends as they discover each other’s worlds and teach each other their skills. I wasn’t sure how this would end but Louise finds a sweet ending to a sweet story and one that makes you feel warm and fuzzy on the inside.